In 2006 I was a Sr. Unified Communications Consultant and used VMware Workstation on my home computer to try out various software products. By 2008 I had some customers wanting to virtualize Exchange and other services, but my exposure to the ESX platform was still limited. In 2009 I started a new job as a Lead Systems Engineer for a U.S. Government project and took my first vSphere 4.0 install/configure course. After that course I was truly fascinated with the technology, breadth of skills needed, and the wicked cool features like vMotion. Ever since then I’ve focused on virtualizing enterprise services and VDI. Through my blog came to know several well-known bloggers and virtualization geeks. By 2013 nearly all of them were VCDXs and I told myself that I could do it. VMworld 2013 in San Francisco was a turning point and lit a fire to knock out my VCDX. I also figured it would professionally open up doors that might not otherwise be as open. 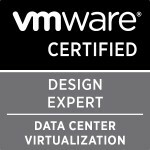 I took my first ever VCAP exam (VCAP5-DCD) the day before VMworld 2013 San Francisco, and passed. A few weeks later I took the VCAP5-DCA exam, and was also successful. All told it was a six month effort from starting the VCAP pre-reqs and getting my VCDX congratulations letter. The certification takes a lot of time. How much time depends on the complexity of your design, and how much may already exist in terms of documentation that you can use. Not much existed for the project I chose, so I spent literally hundreds of hours writing everything to make sure it met the VCDX blueprint requirements. Also, get involved in a study group early on, so you can do peer reviews and support each other throughout the process. Overall I wouldn’t change anything, except getting connected with more candidates prior to the initial application submission. I had connected with two others, but didn’t know there were a dozen more on the same track. Definitely get on Twitter and find your peers. Social media blew up (in a good way) after getting my certification. After being accepted to defend for the VCDX but prior to my passing I had accepted an offer from Nutanix as a Sr. Solutions and Performance engineer. That team already has two VCDXs, and I couldn’t be more excited to join them and other VCDXs within the company. The entire process was totally worth it. I feel that I’m a better architect, and made great professional connections with both existing VCDXs and those that went through the PEX 2014 process. Categories: Certifications, VCAP, VCDX, Virtualisation, VMware | Tags: Certifications, VCDX, VCDX5, Virtualisation, virtualization, VMware | Permalink.